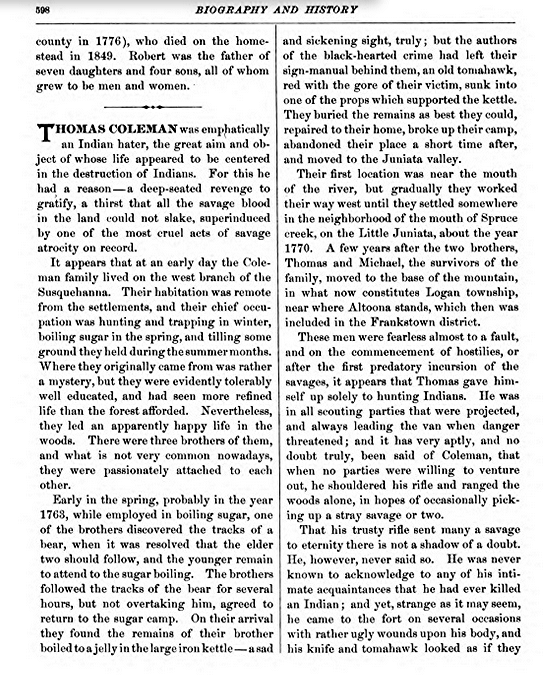 THOMAS COLEMAN was emphatically an Indian hater, the great aim and object of whose life appeared to be centered in the destruction of Indians. For this he had a reason—a deep-seated revenge to gratify, a thirst that all the savage blood in the land could not slake, superinduced by one of the most cruel acts of savage atrocity on record. It appears that at an early day the Coleman family lived on the west branch of the Susquehanna. Their habitation was remote from the settlements, and their chief occupation was hunting and trapping in winter, boiling sugar in the spring, and tilling some ground they held during the summer months. Where they originally came from was rather a mystery, but they were evidently tolerably well educated, and had seen more reﬁned life than the forest afforded. Nevertheless, they led an apparently happy life in the woods. There were three brothers of them, and what is not very common nowadays, they were passionately attached to each other. Early in the spring, probably in the year 1763, while employed in boiling sugar, one of the brothers discovered the tracks of a bear, when it was resolved that the elder two should follow, and the younger remain to attend to the sugar boiling. The brothers followed the tracks of the bear for several hours, but not overtaking him, agreed to return to the sugar camp. On their arrival they found the remains of their brother boiled to a jelly in the large iron kettle — a sad and sickening sight, truly; but the authors of the black-hearted crime had left their sign-manual behind them, an old tomahawk, red with the gore of their victim, sunk into one of the props which supported the kettle. 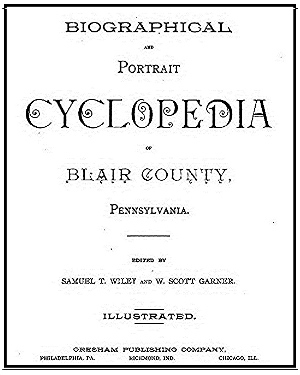 They buried the remains as best they could, repaired to their home, broke up their camp, abandoned their place a short time after, and moved to the Juniata valley. Their ﬁrst location was near the mouth of the river, but gradually they worked their way west until they settled somewhere in the neighborhood of the mouth of Spruce creek, on the Little Juniata, about the year 1770. A few years after the two brothers, Thomas and Michael, the survivors of the family, moved to the base of the mountain, in what now constitutes Logan township, near where Altoona stands, which then was included in the Frankstown district. These men were fearless almost to a fault, and on the commencement of hostilies, or after the ﬁrst predatory incursion of the savages, it appears that Thomas gave himself up solely to hunting Indians. He was in all scouting parties that were projected, and always leading the van when danger threatened; and it has very aptly, and no doubt truly, been said of Coleman, that when no parties were willing to venture out, he shouldered his riﬂe and ranged the woods alone, in hopes of occasionally picking up a stray savage or two. That his trusty riﬂe sent many a savage to eternity there is not a shadow of a doubt. He, however, never said so. He was never known to acknowledge to any of his intimate acquaintances that he had ever killed an Indian; and yet, strange as it may seem, he came to the fort on several occasions with rather ugly wounds upon his body, and his knife and tomahawk looked as if they had been used to some purpose. Occasionally, too, a dead savage was found in his tracks, but no one could tell who killed him. For such reserve Mr. Coleman probably had his own motives; but that his ﬁghts with the savages were many and bloody is susceptible of proof even at this late day. We may incidentally mention that both the Colemans accompanied Capt. Blair’s expedition to overtake the Tories, and Thomas was one of the unfortunate “Bedford scouts”. 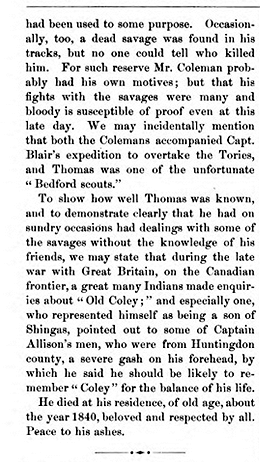 To show how well Thomas was known, and to demonstrate clearly that he had on sundry occasions had dealings with some of the savages without the knowledge of his friends, we may state that during the late war with Great Britain, on the Canadian frontier, a great many Indians made enquiries about “Old Coley;” and especially one, who represented himself as being a son of Shingas, pointed out to some of Captain Allison’s men, who were from Huntingdon county, a severe gash on his forehead, by which he said he should be likely to remember “Coley” for the balance of his life. He died at his residence, of old age, about the year 1840, beloved and respected by all. Peace to his ashes.